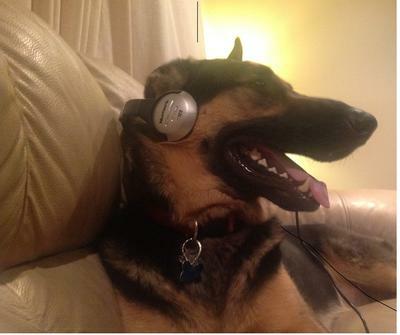 This is a picture of my GSD on his 1st Birthday, listening to classical music. Ranger is 3 years old now, and he's the joy of my life! He loves to play with the ball in the backyard, he loves to sit between my husband and I on the couch, he loves to hang off the side of my bed with his 2 front paws up on the bed and just stare at me. Ranger 'talks' to us and is very expressive and sometimes I wish he could actually talk. He is Bi-lingual and understands English and Punjabi both. I cannot imagine my life without my Ranger and hope he will be with us to the fullest of his life...why do they have to live such short lives? Great picture of your German Shepherd, btw! Yes, German Shepherds can be very vocal and I have always loved that quality about them. With some GSDs it's almost as if they want to have an actual conversation with you. I wish you and ranger nothing but the best - continued success and maybe some time in the future you can send us an update on how ranger is doing! Thanks again - German Shepherds Rule!! Your boy is a Handsome one!!! He sounds like a lot of Love. German Shepherds are Amazing, I wished everyone could see what we see. Take care of your boy Ranger and he will take care of you.